‘Is my burger ready yet? is one of the most common questions heard when the grill is fired up. Using a wireless meat thermometer is the best way of ensuring that those burgers are not only cooked to the minimum temperature needed to prevent foodborne illness, but to also make sure they are not overcooked. 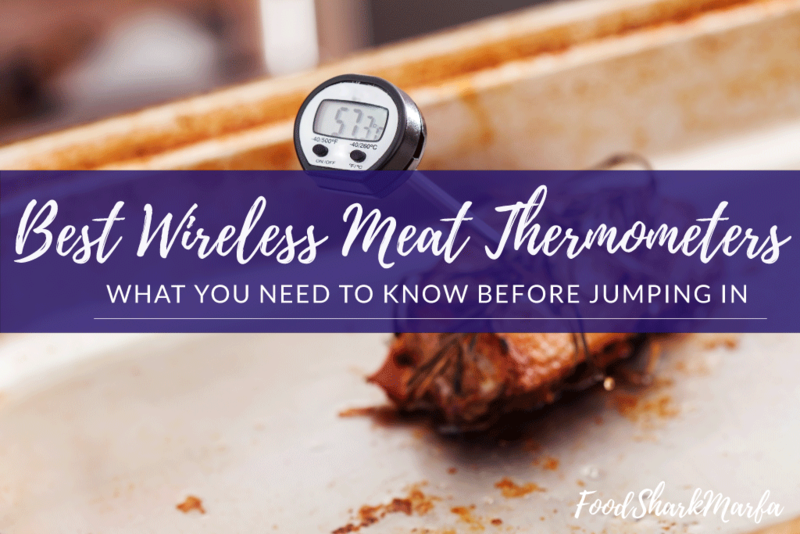 This review will look at what makes a wireless thermometer the best wireless meat thermometer and also why, if you are not already using a one, you should consider investing in a wireless thermometer. Whichever way you prefer your ribeye, the ThermoPro TP20 Wireless Meat Thermometer offers what you need and much more to ensure that you will always cook it safely. Is the TP-08S Dual Probe Thermometer which offers all the basics of the wireless thermometer with a sensible price tag. 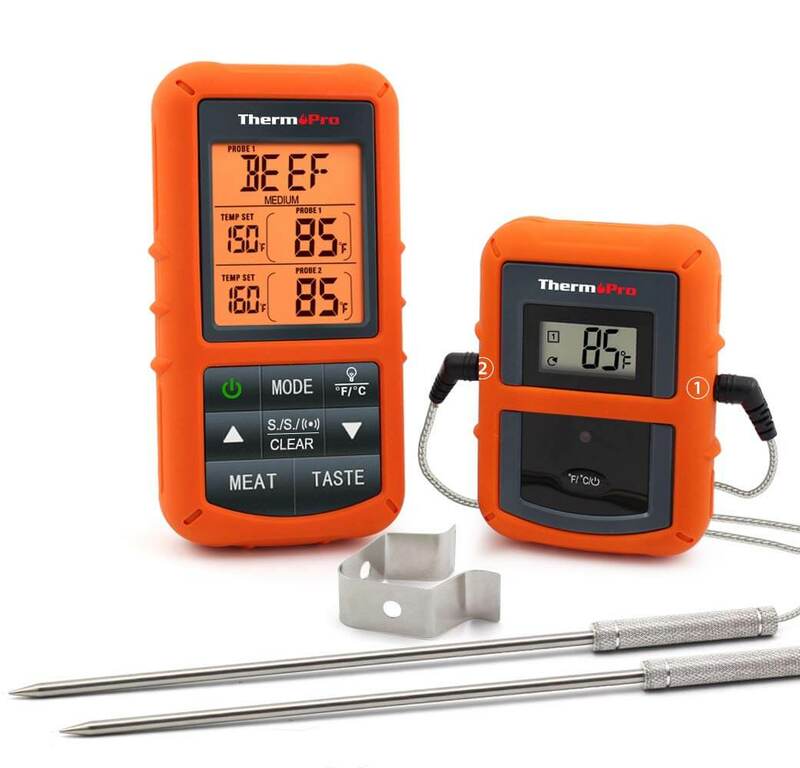 The battery operated ThermoPro TP20 Wireless Meat Thermometer is a dual probe thermometer which means you can use it to monitor two different meats at the same time, or just one meat and the temperature of your oven, smoker or grill. Its mobile receiver has a range of up to 300ft which allows you to monitor your cooking without having to stay in the kitchen or yard. The temperature readings are available in Fahrenheit and Celsius and it has been programmed with the USDA temperatures for a range of different meats such as poultry and ground poultry, lamb, beef and ground beef, pork, veal and fish. The LCD display is also backlit, providing ease of use in the dark. As well as offering the pre-set programs for different meats, the TP20 is also programmed with five USDA approved ‘doneness’ levels. Although this makes it easy for you to cook your meat to these preferences, whether Rare or Well Done, you may need to experiment slightly as it may be that these doneness levels may under- or over-cook slightly to your personal preferences. There is a timer and you can set an alarm when cooking so that when the food reaches the required temperature, the thermometer will beep and flash. There is the option to either stand the thermometer up or hook on the oven door and when it is turned off, it stores its temp and timer settings. 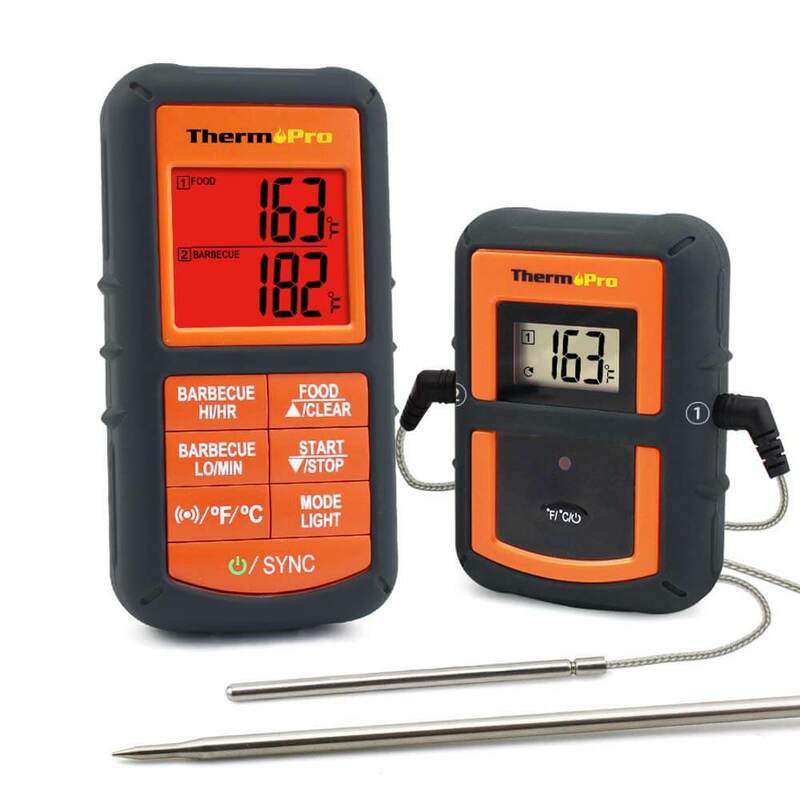 The TP-08S Dual Probe Thermometer allows you to not just monitor the temperature of your meat, but also that of the grill/smoker/oven, or even just two meats cooking at the same time. The transmitter can be hooked onto your oven door or stood up and the receiver also has its own built in stand. The transmitter has 8.5” food grade stainless steel oven probe and 3” oven/BBQ probe which can withstand temperatures of 716°F. (380°C). The probes also obtain temperatures quickly and accurately between the range of 32°F to 572°F (0°C to 300°C) with an accuracy level of +1.8°F (+1°C). With the receiver able to operate up to 300ft, the TP-08S is shockproof and has a timer and alarm, allowing you to pre-program your cooking requirements. It’s worth noting that the four AAA batteries may drain quite quickly if you’re using it for longer cooks such as overnight smokes. 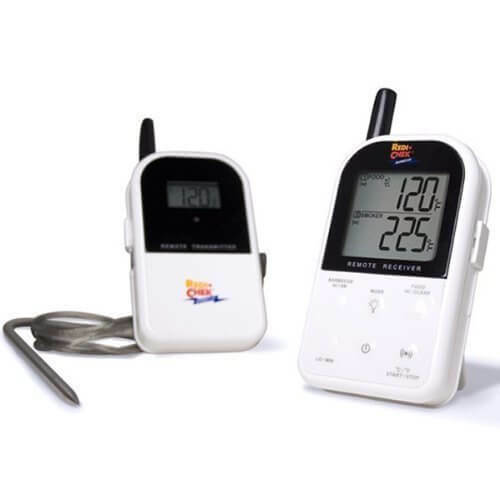 The Maverick ET-732 Remote Smoker Thermometer is designed to allows you to not just monitor the temperature of your meat, but also the temp of your grill or smoker. It is also suitable for use in the oven or on the hob but the shape of the of the probe may be a little more awkward as it is designed as a smoker thermometer. The Maverick also contains a timer and the receiver will flash and beep if the temp falls below the programmed range. 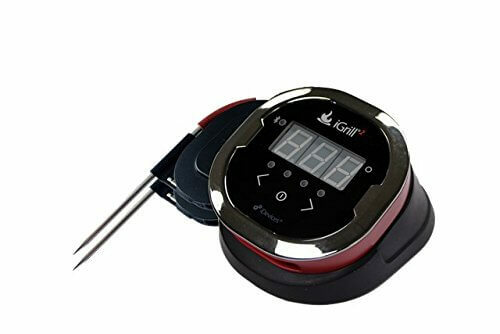 Monitoring temperatures of 572°F (300°C), its probe can be inserted up to 6” into meat and when turned off, the timer, grill and timer setting are stored. With a Bluetooth range of 150ft and a 200-hour battery life, the iDevices iGrill2 Bluetooth Thermometer is designed for easy monitoring of the grill. The iGrill2 contains two food grade stainless steel probes but you have the option to purchase up to two additional probes - all four can be used for multi cooking and controlled via the iDevices Connected app. With a compact freestanding design, you can also attach it magnetically to your grill outer. Its illuminated display offers easy reading and you can use either pre-set temps or set your own within the range of -22° F (-30°C) to 572° F (300°C). When temperature is reached, an alarm will sound on your phone app. 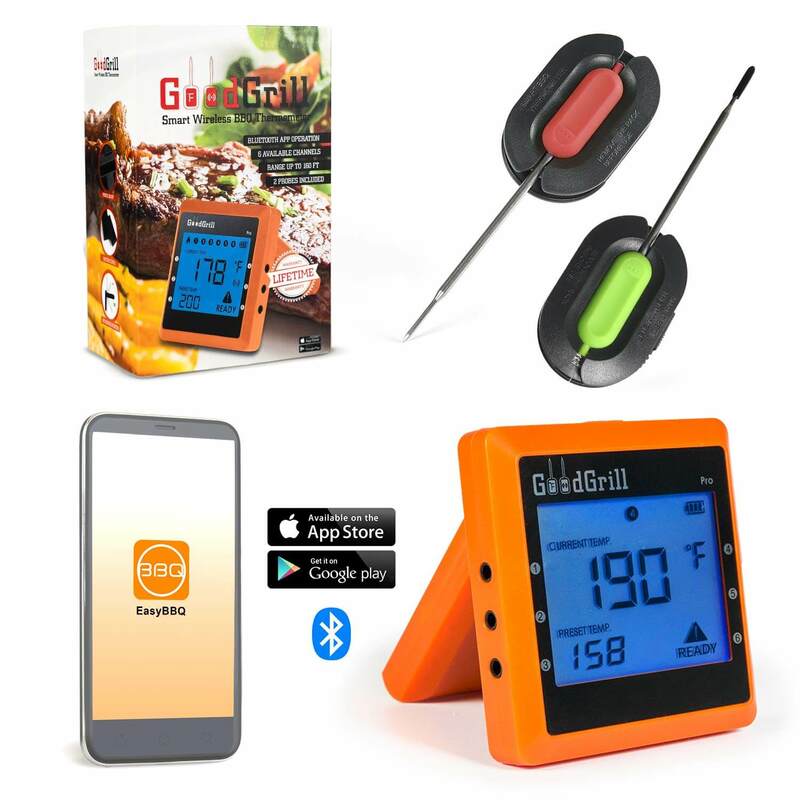 Although Bluetooth control offers many advantages when grilling, if you have an older phone or your Bluetooth connectivity is poor at times, then you may not be able to use the iGrill2 as efficiently as it has been designed to be used. The third generation Maverick ET-733 has been updated with new features and a larger easy read display. With a belt clip or built in stand, the receiver allows wireless real time monitoring of up to a 300ft range of two temperatures, whether meat and grill, two meats or even two grills or ovens. It can also be useful for monitoring the top and bottom of an oven or smoker as temps can vary between the two levels. The probes have grill clips for easy attachment and if you move out of the wireless range for more than one minute a loss of signal alarm sounds. The unit not only allows you to set your own cooking temperatures, but also has presets for 15 meats including the more unusual cuts of Rabbit Boar, Elk and Buffalo! When the required temp is reached an alarm will sound. You can also set the timer when cooking. The ET-733 has a temperature range of up to 716°F, which is higher than some other thermometers, although the display does need manually switching between Fahrenheit and Celsius. The programing of this unit may not be as intuitive as it could be, so it may take a little longer if you are setting your own cooking temp and timer. The probe of the MEATER Wireless Smart Meat Thermometer is fully wire free, with one sensor to monitor the meat temp and a sensor at the other end which monitors your oven/ambient temperature. The meat temp is measured up to 212°F and the ambient/grill temperature up to 527°F. Using Bluetooth connectivity, it has a 33ft range, or with Wi-Fi this extends up to 165ft. The MEATER app allows you to connect to Alexa via the MEATER Cloud account so you can check on cooking progress without having to look at the app. Full use of this thermometer may be limited by your Bluetooth and/or Wi-Fi connectivity, so you may want to investigate further as to whether your personal devices will support full operation at distance from this unit. 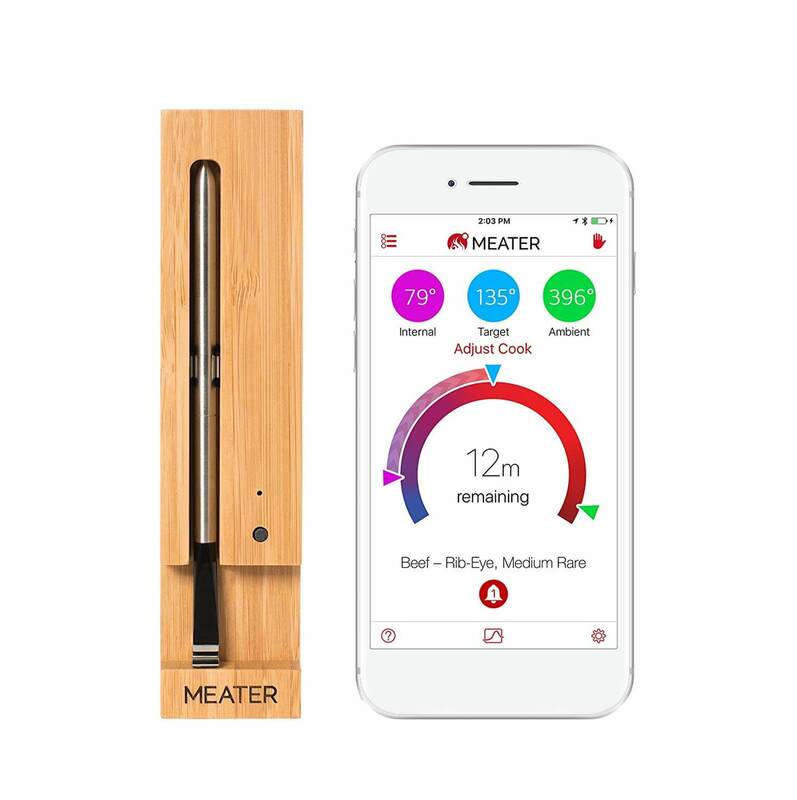 The MEATER also offers a guided cook system and an Advanced Estimator Algorithm which will allow you to estimate meat cooking and resting times. You can also set up notifications based on cooking time/temps. The COMLIFE Smart Digital thermometer is a Bluetooth wireless thermometer with six probes, allowing easy multi cooking. It has a temperature range of between 32°F and 572°F (300°C), with accuracy of between +1 to +3°F (depending on temperature). It has a large display and designed for easy use of between one to six probes at any one time. The probes are also color coded for ease of use. It has a variety of preset cooking temperatures for meat and even offers smoking options, such as Hot Smoke and Cold Smoke, or you can set your own cooking temps and times. An alarm sounds when cooking reaches its desired temp/time. The Bluetooth connectivity is controlled through a phone app and allows a range of up to 98ft indoor or 197ft outdoor. It also requires Wi-Fi for the app which means that if you want to use it for grilling in more remote areas it may not be suitable due to lack of Wi-Fi. 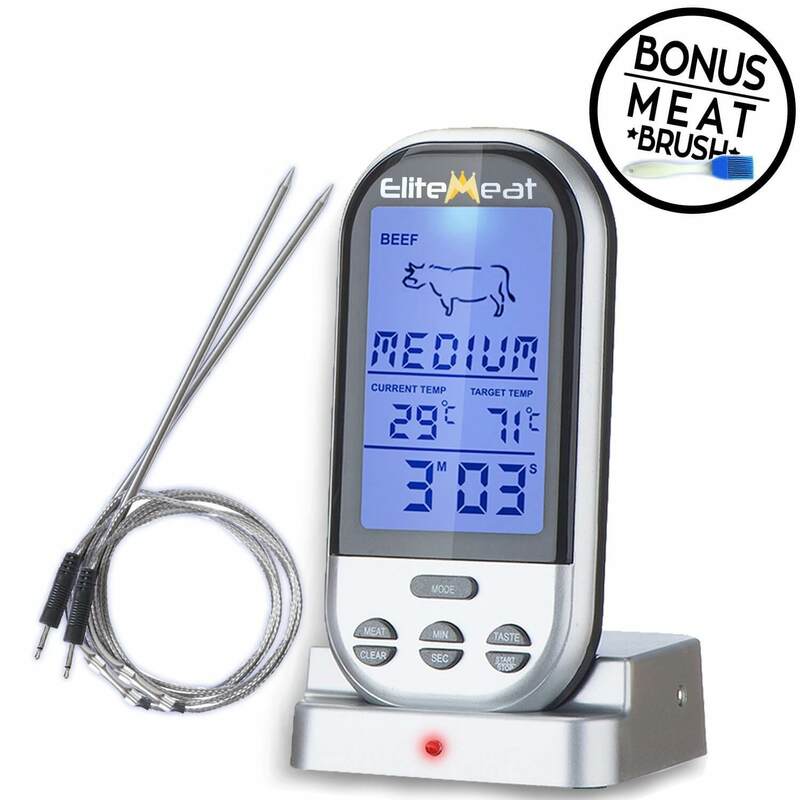 Offering settings for different types of meat and ‘doneness’ levels, the dual probe Elite Meat Digital Wireless Meat Cooking Thermometer allows temperature monitoring of your meat and the oven/grill/smoker. You can choose whether to cook in Fahrenheit or Celsius on this battery-operated unit and the receiver can be used as is or placed on a separate stand. An alarm sounds when temp is reached, and its large backlit display makes it easy to check on your cooking at any time of night or day. This unit may not have the most ease of use if you want to set your own temperatures rather than using the pre-programmed ones. 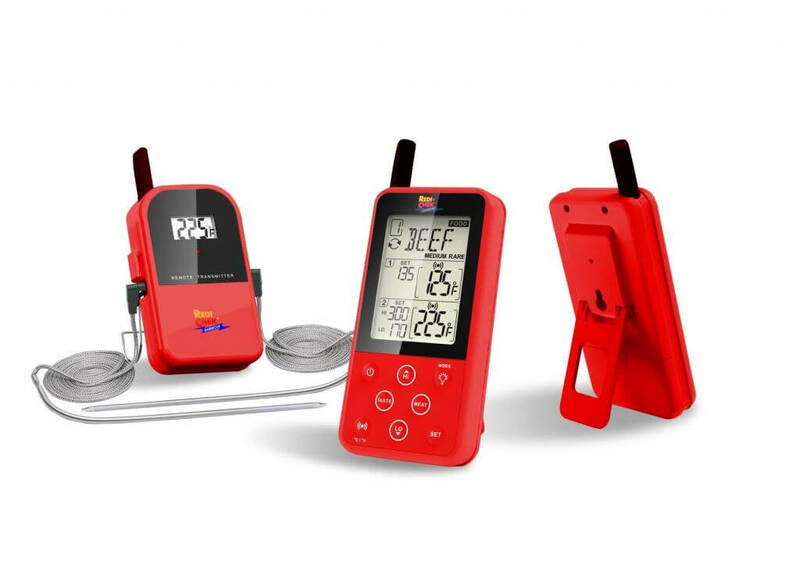 The Bluetooth connected GoodGrill Wireless Meat Thermometer comes with a lifetime warranty and has a range of around 160ft and is pre-programmed with USDA recommended temperatures. As well as offering preset programs, the app is designed to allow you to easily set your own cooking requirements and when temp/time is met, the alarm sounds. Up to six food grade stainless steel probes with extra-long wires can be added to this unit, allowing multi cooking and the backlit LCD screen allows easy reading whatever the quality of light. 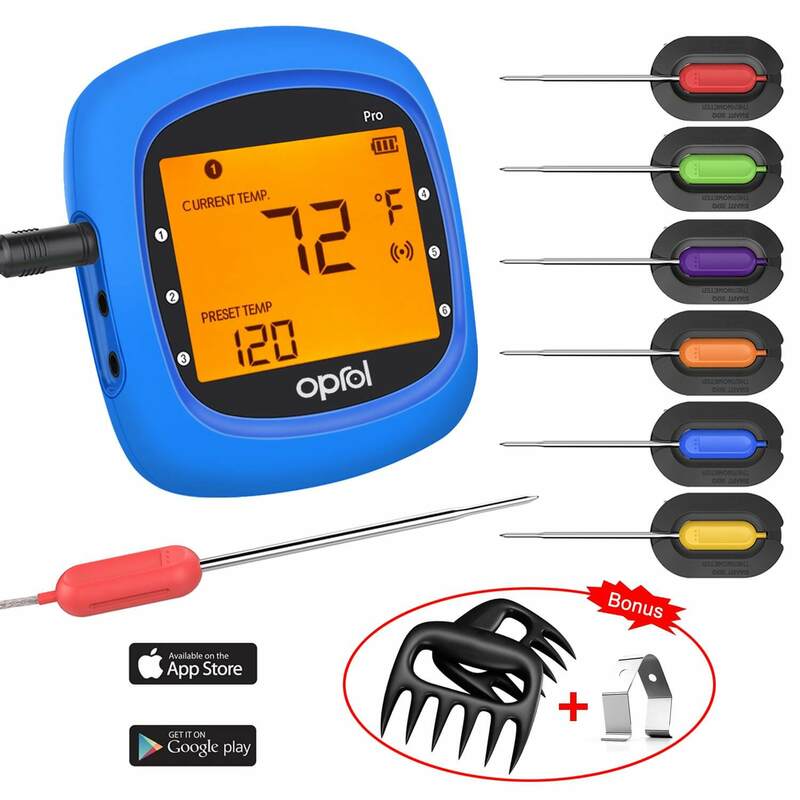 Designed for multi cooking, the Oprol Bluetooth Meat Thermometer has six probes that can be used to read meat and/or grill temperatures at the same time. Its Bluetooth connectivity offers a range of up to 100ft indoors or 196ft outdoors. The probes have heat resistant silicon handles and are color coded for easy use. The temperature is shown on the easy read backlit display of the receiver or on the downloaded easy to use app. There are various pre-set programs in line with USDA recommendations. There is an alarm on the app and on the unit itself. A set of meat claws also come alongside this thermometer. Its temperature range is 33˚F to 572˚F (1˚C to 300˚C) with ±1.8˚F/1˚C accuracy. Thermometers aren’t just there for cooking meat, they can also be used to help ensure we store and serve food at the correct temperature, all of which can help minimize our risk of foodborne illness. The United States Department of Agriculture (USDA) sets temperature requirements to help maintain food safety. The USDA states the minimum requirements for cooking raw pork, beef, veal and lamb chops and roasts is to an internal temperature of at least 145°F before turning heat off. The meat should also be allowed to rest for three minutes or more before carving or eating. Ground meats should be cooked to at least 160 °F and poultry to at least 165°F. The USDA also recommend that fish, shellfish and fresh hams are cooked to an internal temperature of 145°F. If you are reheating a ham already cooked, then you should reheat to 140°F if it was packaged in a USDA-inspected plant, otherwise all other hams should be reheated to 165°F. If you are using chafing dishes when serving, you should keep any hot food (including meats) at 140°F or above. Cold food should be kept at 40°F or below. Food between 40°F and 140°F is in what is called the Danger Zone as this is the temperature range in which pathogens grow most rapidly. Some bacteria can double in number within 20 minutes in the Danger Zone. This is why safe cooking temperatures are usually above 140°F. The USDA recommends we always use a food thermometer for accuracy when cooking meat, fish or even other foods such as eggs. The USDA Food Safety and Inspection Service or FSIS say that in their research, one out of every four hamburgers cooked actually turned brown in the middle before it had reached a safe internal temperature. Using a thermometer also prevents us from overcooking – something that sometimes happens when we cook for longer just to be certain that it is cooked. Unfortunately, when we do overcook meat, it not only dries out, but also loses flavor. The traditional thermometers tend to be those used during cooking i.e. we must keep popping the thermometer in the steak on the grill or take the chicken out of the oven to check it. Wireless thermometers allow us to leave the probe in during cooking, whether in the over, on the grill, in the pan or in the smoker. Unless specified, wireless thermometers cannot be left in food cooked in the microwave because the probes are stainless steel. Instead the thermometer should just be used to check temperature when the food is taken out. Do be careful to make sure the cooking temperatures will remain within the specified temperature range for the thermometer. Being able to leave the thermometer in the meat is what allows us to make sure that it cooks to the correct internal temperature, but, unlike the traditional thermometer reduces the risk of us overcooking. Wireless thermometers take temperature readings constantly, often around every second and they are called wireless because they use wireless technology such as Bluetooth or Wi-Fi or may operate on a radio frequency (RF). If a thermometer is wire free, this means that the probe does not have a wire or cable connecting it to the transmitter or unit. The probe on most wireless thermometers is usually attached via a wire to a transmitter or unit which stays near the grill or oven and the transmitter then sends the temperature info to either a standalone receiver and/or to an app via Bluetooth. This wireless set up means that you do not have to stay near the oven and watch the temperature, instead you can move around - as long as you stay within range of the transmitter. There can be some issues around Bluetooth and/or Wi-Fi connectivity if you do not have the best signal and if you may want to use a wireless thermometer when RVing or camping, it’s worth checking suitability before you leave. Battery life can also be a consideration. If you tend to do a lot of long smokes or roast very large joints, you may want to consider using higher powered branded batteries rather than generics. Some thermometers also have a low battery alarm which you may find helpful. Thermometers should always be inserted into the thickest part of the meat or fish and you should make sure you avoid any fat, bone or gristle as these will give different temperature readings. If you are cooking poultry or turkey, then insert the thermometer into a thigh – avoiding the bone. You should also check temperature in a wing and the thickest area of a whole turkey or a game bird. For ground meat and patties insert the probe into the thickest area. If your patties are thin, then insert the probe sideways into the center. When a thermometer is taken out of meat it should always be washed in hot soapy water before you use it again and you should also refer to any additional manufacturer’s instructions for using the thermometer properly. Cooking meat and fish to the recommended minimum temperature helps reduce the risk of foodborne illness, something that causes around 3000 deaths and 48 million illnesses every year in the US. Not only can foodborne illnesses be caused through eating undercooked meats but also through cross-contamination of different meats and between raw and cooked meats. Just some of the main bacterial contaminants or pathogens in meat are Campylobacter, Clostridium and Cryptosporidium. Other pathogens include E.coli 0157:H7 which is common in ground beef, Listeria in cold cuts and deli meats, Salmonella in poultry and Vibrio vulmificus in fish. At the least, these pathogens can cause severe cramps, nausea, vomiting and diarrhea – sometimes bloody. Young children, the elderly or sick may also be at risk from additional complications if they acquire a foodborne illness. ‘Doneness’ is more personal than statutory food safety regulations which state minimum internal temperatures to destroy pathogens. Thermometers programmed with levels of ‘doneness’ means that they will still measure to a predetermined internal temperature but allow the meat to be cooked more as we may prefer it, such as roasting a beef joint that stays pink in the middle rather than brown. Using a wireless thermometer with daily food preparation would go some way to reducing the 48 million illnesses in the US estimated to be caused by food. Not only that, because wireless thermometers are designed to stay in our meat and/or oven all through cooking, they allow us to be proactive and ensure that when we cook burgers for ourselves and for our families and friends, they are as safe as they can be. So, when someone asks, ‘Is my burger ready yet?’ it means that you can say ‘yes’. 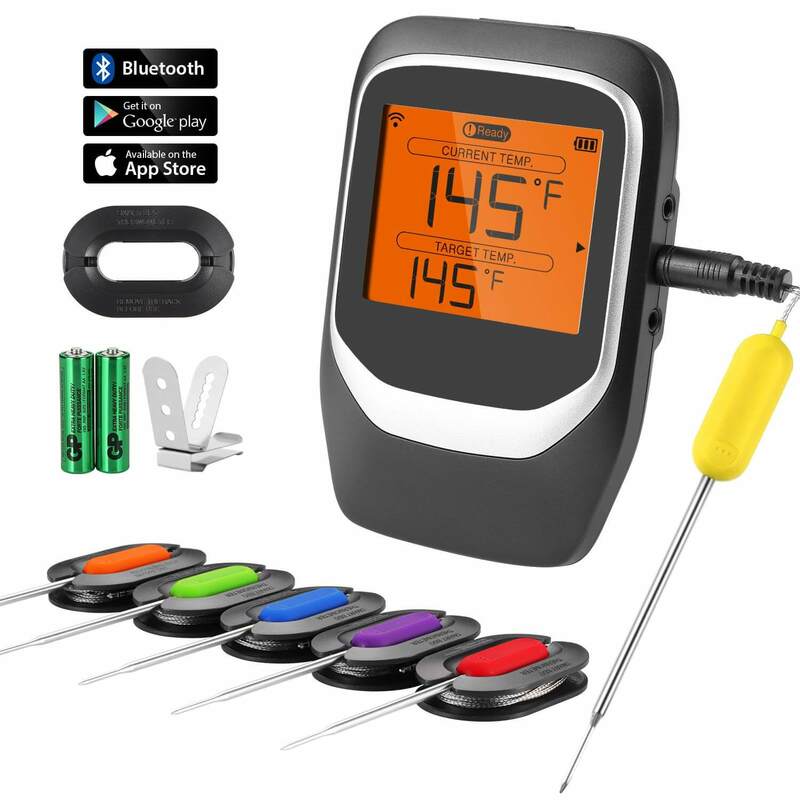 Just as you know those burgers have been cooked to the minimum safe temperature as you have used the best wireless meat thermometer you also know that what you are serving is juicy and full of flavor. Unlike the overcooked burgers that your neighbor across the street regularly offers to guests when he fires his grill up. And, do remember that wireless thermometers aren’t just for cooking meat, they are suitable for a wide range of foods cooked in a variety of appliances.